Abc Child Development Center, Inc. Welcome to Abc Child Development Center, Inc.
Where do you want your child to spend their very first years? Do you want them to build friendships and learn social skills? Do you want them to have the best time learning and having fun simultaneously? Do you want to ensure that your child is safe in a nurturing learning environment? All of us parents have the same concerns. At ABC Child Development Center, Inc. we consider our school to partake in the responsibility of raising responsible children because the youth today will soon take care of our community. With our long term vision for community building, we fulfill our roles as educators by providing quality early childhood education. The first few years your child will spend with us are stepping stones for them to grow and become academically successful but also at the same time, their responsibility to their families and respective communities will start to grow. Our programs also build character and instill healthy social relationships with peers. Most of all, we add a dash of fun into the learning process. Find out more about our programs. Visit us at 32 Grant Circle NW Washington, DC. Keep visiting the ABC Child Development Center, Inc. website. We are happy that you found time to drop by today. 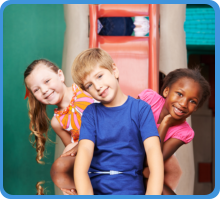 Please call us at 202-829-8444 for inquiries about our child care programs. Download our Parent Handbook to know what to prepare on your child's first day, school calendars, fees and playment plans, and other helpful information about ABC Child Development Center, Inc.